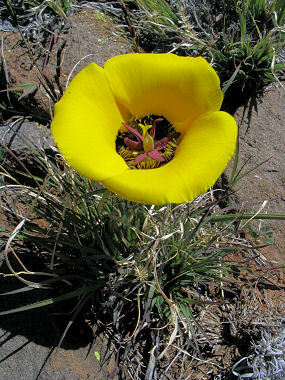 The Desert Mariposa is a perennial herb and member of the lily family. It also produces one of the most spectacular flowers that can be seen in the desert. The flowers typically bloom for about 1 week in the late spring if rainfall has been sufficient. During dry spells, the bulb will remain dormant and can survive in that state for several years. 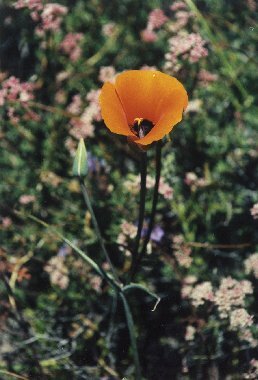 Flowers are orange or yellow with 3 broad petals that form an open cup. The plant grows in rocky or heavy clay soils from 2000 to 6500 feet in elevation. Mariposa means "butterfly" in Spanish. The plant itself is unassuming and difficult to spot when not in bloom. The mariposa can grow to 2 feet in height and usually has a few grass-like, gray/green leaves. You would think, with its brilliant flower, that the Mariposa would make a nice plant for the garden, however, attempts at cultivation have been unsuccessful. Given the heavy handed 'management' of many large wilderness areas, it's interesting that the needs of this one small plant are not understood well enough to enable cultivation. There may be a lesson in conceit here.